Hey, Thank you UK. We think you're pretty fantastic too! 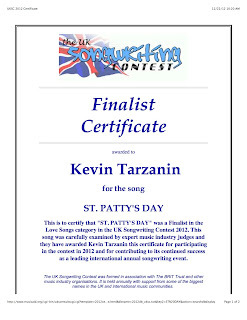 The UK Songwriting Contest is a well established since its launch in 2002. Of over 6,000 entrants, less than the top 1 per cent make the finals and only around the top 3 per cent make the semifinals. Of our four songs submitted, 'Time' and 'Sangria' were placed in the semifinals besides the finalist entrants above.